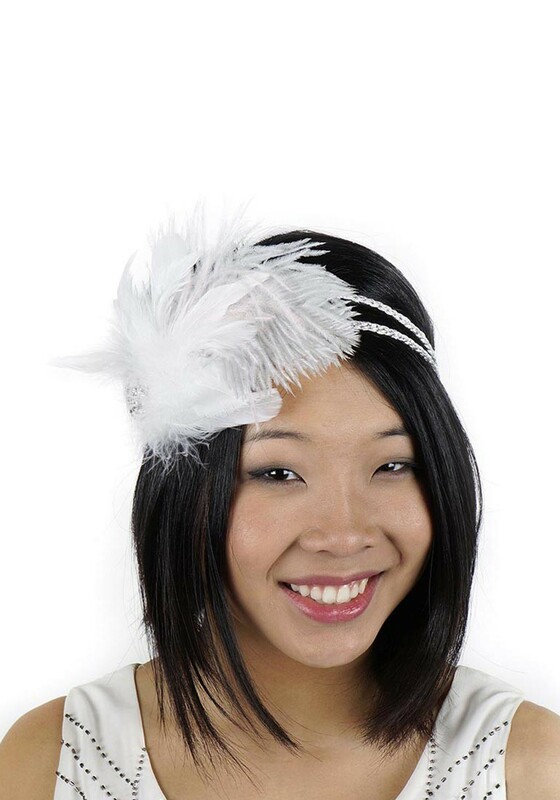 People will think they had walked right through a time-portal somewhere along the way once they see your 1920's Flapper Costume complete with this beautiful headband! It has almost been one hundred years since the Roaring Twenties and, as a whole, America has come very far since then, but as it often does, history continues to repeat itself. Still today you can see the younger generations rebelling against social norms just as the Flappers were known for doing. If you want to pay homage to these brave and fun-loving women of the 20's then throw on a knee-high dress, a fancy pair of high heels, get a bob cut for your next hairdo, and accessorize it with this White Flapper Headband with Rhinestones! The feathers and lovely jewel will tell everyone that you came to be the life of the party and when you start using classic flapper slang while dancing to some smooth jazz no one will be able to crash your good time.